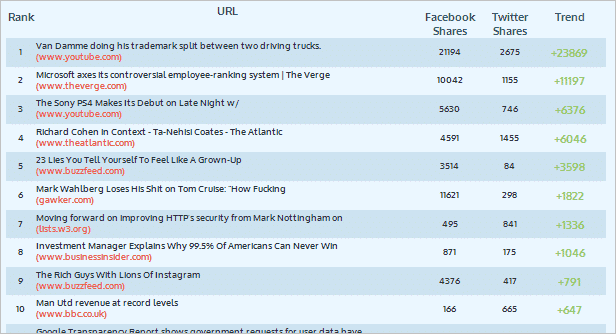 Are you curious what posts are currently the most shared items on Facebook and Twitter? Rad URLs has you covered. 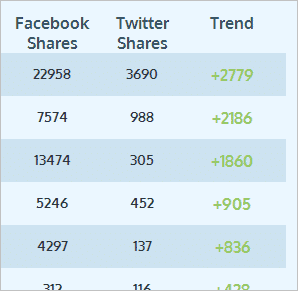 This brand new service displays the top 100 pages currently trending on these two social networks. Rad URLs gathers shared URLs in one place and displays them in a billboard format that lists the most popular stories around the web. Just scroll through them to find which ones are shared the most on either social platform. If you like the idea of staying current with popular URLs, subscribe to an RSS feed of Rad URLs – you can find this link at the bottom of this post. The default view shows a rank of articles by their trending status. That is, the articles are being sorted based on a current mark of their popularity. Sort by Facebook shares: Click here to do this. Sort by Twitter shares: Click here to do this. There are no indications as to how the site calculates the “Trend” count (let alone social share counts), so we can’t comment as to its authenticity yet. When we contacted Sameer Noorani, the creator of Rad URLs, he said he couldn’t release the details of the algorithms used. Open a link by simply clicking on either the title or red URL. Preview a page before opening by hovering over the entry. If you’d like to stay up-to-date with these trending articles, we’ve created an RSS feed you can grab here. 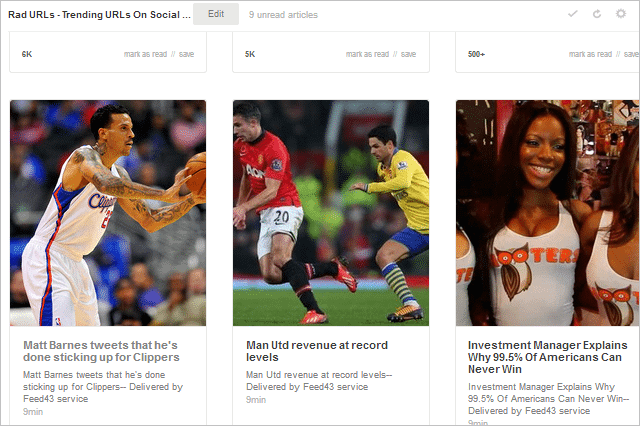 You can then add it to Feedly or another reader to stay on top of these articles. 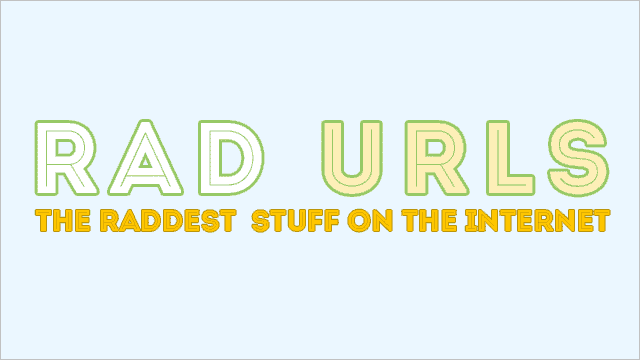 Note that Rad URLs is currently in the process of creating their own feeds, so stay tuned for that update. The above URL was created by us to subscribe to their updates now and if you are interested you can use till the guys over at Rad URLs release the official RSS feed. Although we don’t know what’s happening behind the curtain, the posts gathered at Rad URLs are pretty useful for staying on top of the most popular articles being shared in the social sphere. The service is new and still, has a lot of scopes to improve. If implemented properly this can get a lot of traction with the net savvy crowd. Knowing which news stories are trending currently and what kind of response they have received on the top 2 social networks is always fun (and informative), so we’d recommend you to check out this service today.